On Easter Sunday, we went to High Park here in Toronto for a walk. Since spring is yet to arrive, we were faced with a dry and dead looking winter landscape. There wasn’t a green bud to be seen and the landscape reminded me of our recent trip to the Deccan plateau in India where we visited the Ajanta and Ellora caves. 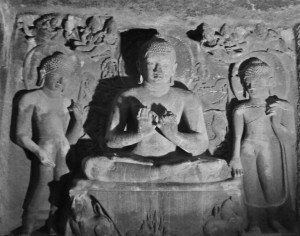 In Ajanta, there has been little rain for over a year and the annual monsoon did not arrive, as such, last year so the land is bone dry and the trees have lost their leaves. The river beds have dried up and there is hardly a blade of green to be seen. 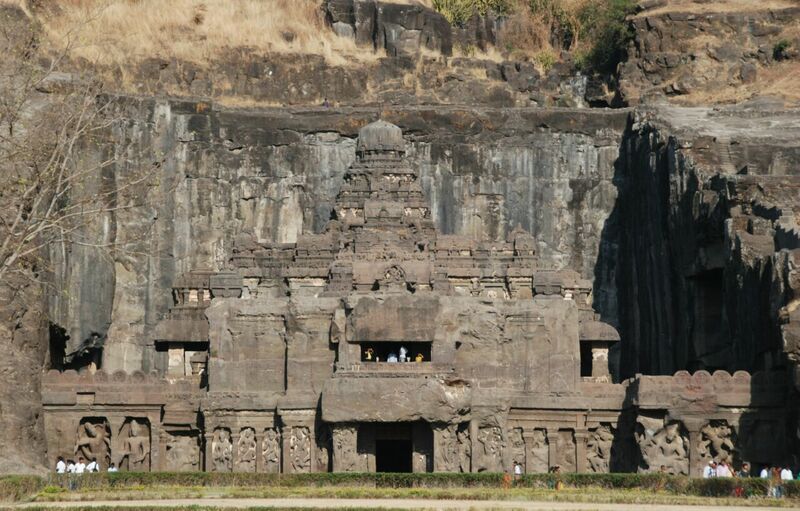 However, the caves, which have been declared a UNESCO World Heritage Site, are spectacular. Excavated from a horse shoe-shaped sheer rock face starting at the top and working downwards, it is hard to believe that such a feat could be possible. 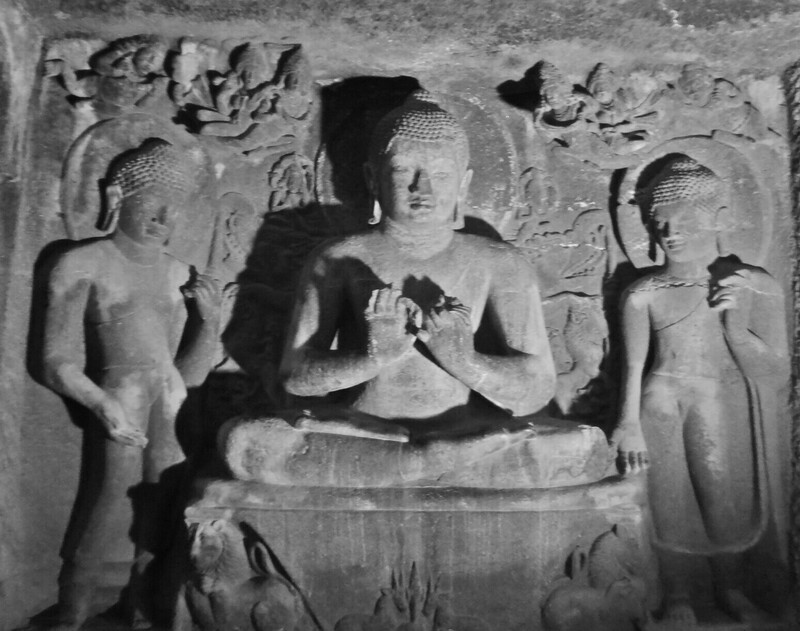 They were started in the 2nd century BC and used until about the 5th century AD by Buddhist monks. Of the 30 caves, some were built as temples complete with vaulted ceilings while others served as living quarters. Originally covered with frescoes in the tempera style, most have been destroyed but a few remain and they are quite amazing. Note the perspective of the pillars in this painting done a thousand years or so before perspective in painting was employed in Europe. The carvings are ornate and very beautiful. It was seriously hot the day we were there and not the best for walking around but fortunately, inside the caves was cool, beautiful and peaceful. Just being in the presence of the sculptures was a spiritual experience. 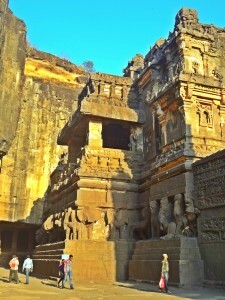 The rock caves at Ellora, some 60km away were even more impressive. 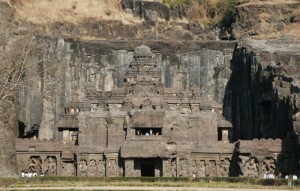 Another World Heritage site, the 34 caves comprise Buddhist, Hindu and Jain temples spanning the 5th to 10th century AD. The Kailash temple is said to be the largest monolithic structure in the world and it certainly felt like it as we climbed the steps in the heat. Not a lot of tourists on account of the heat so it was like having a private viewing at times. By noon we could not cope with the hot sun any longer. However, we were lucky to have a hotel (Hotel Kailas) just across from the caves so, not only could we see the complex from the hotel gardens, but we were able to walk back for a rest during the hottest midday hours. One of the nicest places we stayed in during our travels, we had a large room with a balcony for $30 per night. With a little bit of homework, its really quite remarkable how cheaply one can travel in India. Anyhow, I digress! 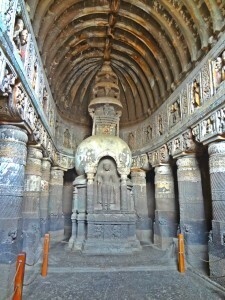 My photos do not do justice to the splendour of the caves but hopefully, you can get some idea. Its interesting how a dry landscape due to the heat, can resemble a dry winter landscape due to the cold. 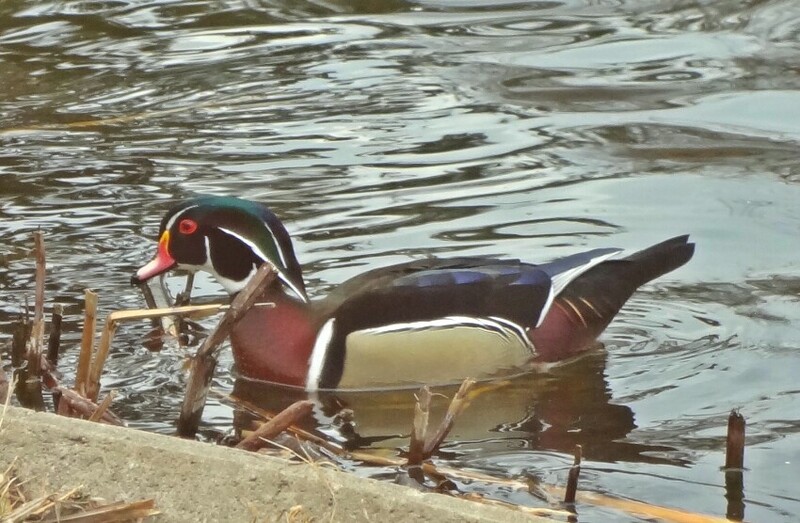 In High Park, where parts of it were similar to the Deccan except that we were muffled up in coats and scarves, northern birds have already migrated south in search of nesting grounds. 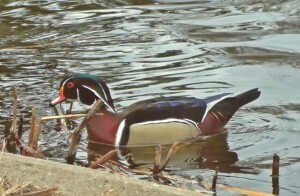 We had the great good fortune to see wood ducks, which we were told, people drive miles to get a glimpse of. So together with swans, Canada geese, and common ducks, the pond was quite the happening scene. Between Indian caves one week and Canadian birds the next, as my friend John who runs WE Tango in Toronto says: “Life is Good”. This entry was posted in India, Living, Toronto, Travel. Bookmark the permalink.